"Bob, I have a band with hot players and great songs. But we need to get to the next level. Please give me the name and number of someone who can give us a break and help us move ahead." Hmm ... How am I supposed to respond? "Oh, you need to get to the next level? Then call Joe at 555 ..." The e-mail writer didn't even tell me what type of music he played, much less try to establish a relationship with me before making this plea for help. Two things are wrong with this e-mail request. First, when music people say, "I just need my big break" or "If I could only be discovered by someone," they're putting control of their career in someone else's hands. I don't believe success is determined by something outside of yourself. With the independent-minded attitude I advocate, success is directed from within. So if you're waiting to be "discovered," you may wait a long time. 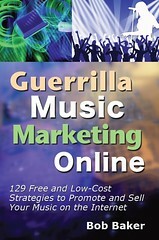 Take control and push forward on your own to create great music and reach more fans. That said, I do agree that it can be beneficial to have fans who are in a position to help you reach even more fans. For instance, when a disc jockey, music editor or booking agent "discovers" your music and really enjoys it, sure, they can do things to boost your notoriety. And that's a great thing. But those specific key people are unique to each artist, and they usually appear organically throughout the natural process of an artist pursuing his or her career (although you can take reasonable steps to make those connections happen quicker). The agent that can help Punk Band A will be of no use to Country Singer B. Understand? So begging for "a name and a number" doesn't make sense unless it's targeted. Bottom line: Make sure your career is inner directed and controlled by you. And keep your eyes open for the natural key contacts that are a good "match" for you and your music. Totally agree with Bob. Recently read a book called Millionaire Mind. Said...the Universe is kind and it wants to make people successful. It sends us people, contacts, opportunities, places, choices, etc...How do we receive these gifts? Do we take action or do we ignore them? How many times do you see a person who appears to be of influence and you're too scared or intimidated to approach them...what if this person had the power to change your career? On the other hand, how many times do you see people that don't look like they have any influence...think about how many times you passed up on the opportunity to say hello and talk. What if that persons parents owned a label company or his friend is a successful promoter? Look at the opportunity that you just passed up because of inaction?! Eventually the Universe gives up on people who don't take action..it stops sending you its gifts. My life took a 360 because of a single decision I made 12 years ago. I needed to earn some money so I decided for one day, I would humble myself and try to sell sports photos at a farmers market. I didnt sell more than $10 worth, but I did meet the guy next to my booth who dramatically changed my life and fortune. I quit a secure but very low paying government job and pursued a career in sales...I went from living in government subsidized housing to amassing a net worth of over $2 million in a short period of time. A thought turns into a feeling, a feeling turns into an action, an action turns into a result...sad that we never got to experience some of the greatest inventions and world's most renowned musicians..all because of people NOT taking action! Take action and watch your career take off to the next level!